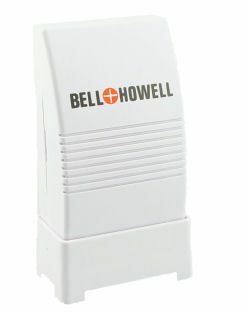 The Bell and Howell flood alarm is a simple to install device that could save you thousands ($$$) in home repairs caused by water damage. You can now eliminate flooded basements, garages, laundry rooms, bathrooms, pools, etc. Simply place the unit in any area where there is a danger of flooding and the alarm will sound if water touches the contact strip protruding from the bottom of the unit. The alarm measures 5" x 2-3/4" x 1-3/8" (not including the contact strip or stand). The contact strip extends five-eight inches from the bottom of the alarm. The stand increases the height by three-eight inches. The alarm takes one 9V battery that is not included.